This isn’t especially exciting, but I don’t want people to think that I’ve been slacking on getting the Camper with No Name outfitted. 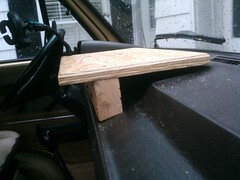 I built a pretty cool shelf to sit on the dashboard and has a mount for my phone. Read on for pics and excruciating details. If you’ve got a VW bus yourself, you should check this out. A friend recently salvaged a bunch of plywood and has word working skills and tools. One thing I’ve wanted badly is a place on the dashboard to mount electronics and such. I had this idea that I could make a shelf that could be affixed to the ashtray. Using my friend’s tools, materials, and expertise, I managed to make a pretty sweet shelf, if I do say so myself. I first cut a section of 4×4 with a notch that fits into the ashtray hole. 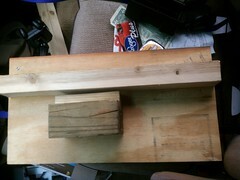 Actually, I first notched a 2×4 with a circular saw, but it was too small. After a consult with my friend, he suggested that I use the table saw, which made the process much, much easier. 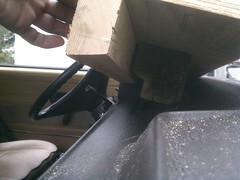 I think I’d like a table saw, but there’s nowhere to put it in the camper. Here’s a shot of the cut out in the 4×4 as well as the 2×4 that I cut at an angle with the table saw (it would have been a real hassle with a circular saw). 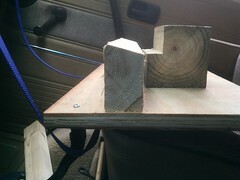 To get the angle right for the 2×4 I put the 2×4 flat on the dash (so it was at an angle) and drew a line on the 2×4 using the shelf as a guide. I then put the shelf in the ashtray and positioned the 2×4 and marked its placement on the shelf with a pencil. I recently managed to break the suction cup on my Rocketfish Universal GPS mount that I’ve been using in the Subaru. I really like the thing and it does a night job of holding my phone. I like it so much that after I broke it, I went and bought another one. The good news is that I was able to remove the suction cup and mount the thing on my new shelf. I drilled a hole the size of the mount thingy most of the way through the board; I quit drilling when the tip of the spade bit had made a big enough hole for the screw to fit in. I think I found a longer screw to use than the one that had come in it. I like that it puts it very close so I don’t have to lean over to get to the phone to make a call or fuss with the GPS. Here’s an especially bad photo of how it looks with the cell phone mount. I seem to have lost my leather jacket with my camera in the pocket, so I can’t take a picture of the cell phone in place. 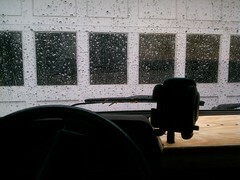 This entry was posted in All, westfalia and tagged outfitting, Uncategorized, westfalia. Bookmark the permalink.